We read all the time about how working puzzles and brain teasers can help ward off Alzheimer’s. I should not be getting Alzheimer’s any time soon. I regularly play words with friends, dots, 1010, candy crush, and alpha Betty. But, my weapon du jour is Lumosity. Lumosity is actually created by scientists and cognitive researchers. I started out with the free app on my IPad (needs to be done on a screen that is bigger than your cell phone) then eventually paid for the full subscription when I got bored with the free games. Lumosity is a series of different brain games, and once you play enough of them you are provided results in areas of speed, problem solving, attention, and more. 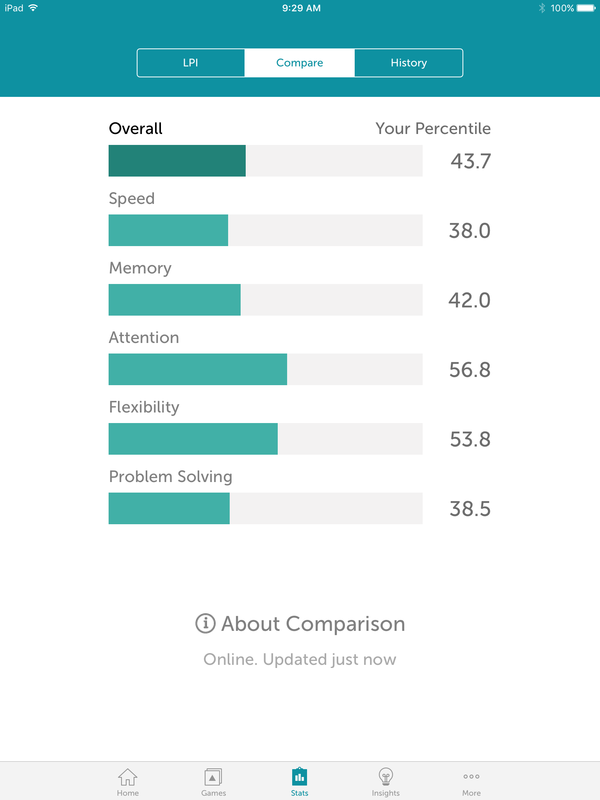 With the paid version you get even more insights into your brain including comparisons to other Lumosity players your age. I play at least once per week. It amazes me how just one or two seemingly “small” variations in my environment or with me personally can affect my results. Just having the TV on, or the hubs talking, the phone ringing, or even just being tired or hungry can reduce my level of attention or focus. There are some games that I absolutely love. Trouble Brewing is tons of fun. With this game you are a barista and are filling coffee orders and you have to pull the cup away when full….if it overflows you lose that cup…you get credit for all orders filled correctly and not overfilled. I think that is my favorite game right now. My least favorite are any of the games having to do with numbers or math. Those games contribute to my lower scores in all categories! But I continue to play then because I believe they will help keep me sharp. It’s no surprise to me that my personal strengths are with flexibility and problem solving. When compared to others my strengths are attention and flexibility. In both personal and comparative my worst area is speed. I’ve always been a slow problem solver! Previous Previous post: I’m sick and tired of being sick and tired….